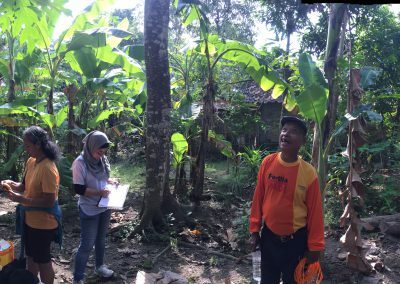 The Indonesian-Dutch research team investigates social, agro-ecological and biological conditions for conserving diversity of bananas. Bananas are deep-rooted in the Indonesian landscape and form an essential ingredient of the daily menu of people in cities and villages. It seems unthinkable that the various uses of bananas, such as eating or sharing fresh bananas, selling bunches to local traders, manufacturing banana chips or wrapping food in banana leaves, will disappear. The international and interdisciplinary research collaboration focusing on the diversity of Indonesian bananas is funded by the Royal Netherlands Academy of Arts and Sciences (KNAW) – Scientific Programme Indonesia – Netherlands (KNAW-SPIN) and a range of scholarships through the Indonesian Directorate General for Higher Education (DIKTI). The programme provides training of four PhD candidates, three post-doctoral research fellows, and a small group of Indonesian master students. The partnership involves the Universitas Gadjah Mada (UGM) in Yogyakarta, the Institut Pertanian Bogor (IPB) in Bogor, the Lembaga Ilmu Pengetahuan Indonesia (LIPI) in Cibinong and Wageningen University & Research, the University of Amsterdam (UvA), the KNAW-Netherlands Institute of Ecology (NIOO-KNAW), and the KNAW-Westerdijk Fungal Biodiversity Institute. The KNAW-SPIN project on banana is coordinated by Professor Gert Kema (WUR) and Professor Siti Subandiyah (UGM).